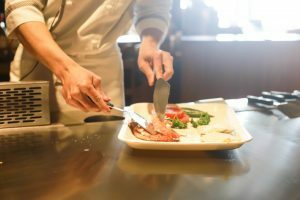 To keep the residents of Hamilton County safe from food borne illness outbreaks, Hamilton County Public Health licenses and inspects more than 2,300 food service operators. Annual food service licenses, new licenses, mobile licenses and temporary licenses are issued in Hamilton County, outside the cities of Cincinnati, Norwood and Springdale. Click here to View Food Operations Fees. Sanitarians inspect restaurants, grocery stores, schools and other facilities for proper food storage, handling, preparation and serving. Sanitarians also conduct food safety training for food service employees and investigate potential food borne illness outbreaks within the Health District’s jurisdiction. To find out about our coveted Clean Kitchen Awards, click here. Hamilton County residents are now able to view inspection reports from licensed food service operators and retail food establishments inspected by the Health District (Hamilton County, excluding the cities of Cincinnati, Norwood, and Springdale). Click here to view CURRENT inspection reports. Digital inspection reports not only help sanitarians complete their work more efficiently, they also give residents an inside look at what a public health sanitarian sees during an inspection. It is important to understand, however, that inspection information provided here shows only the conditions of the facility at the time of the inspection. A single inspection report should not be used to evaluate a food service establishment. Looking at a facility’s inspection results over a period of time gives a more accurate picture of that facility’s commitment to food safety and sanitation. What information will I find on an inspection report? Both critical and non-critical violations are shown on inspection reports. The corresponding food code and recommended corrective actions are listed with each violation so residents understand what is required to correct the problem. This information will help residents better understand Ohio’s Uniform Food Safety Code and what is done locally to enforce it. What are common problems found on an inspection? Many problems found during an inspection are non-critical, do not pose an immediate public health threat and can be corrected while the sanitarian is on site. Non-critical violations, including dirty floors, lack of hair restraints and open waste receptacles, are noted on the inspection report. Critical violations are more likely than other violations to contribute to food contamination, illness or an environmental health hazard. Examples include food obtained from an unsafe source, inadequate cooking, improper holding, contaminated equipment, and poor personal hygiene. Critical violations may require additional follow up from the sanitarian to ensure the problems are corrected properly. Critical violations are noted on the inspection report, along with corrective action steps. In rare occasions, it may be necessary to close a restaurant or other food service operator due to an imminent health hazard. An imminent health hazard may exist because of an emergency such as a fire, flood, extended interruption of electrical or water service, sewage backup, misuse of poisonous or toxic materials, the onset of an apparent food borne illness outbreak, a gross unsanitary occurrence or condition, or other circumstance that may endanger public health. Depending on the type of facility, inspections occur unannounced, one to two times per year, not including follow-up inspections. A sanitarian may also choose to conduct additional inspections throughout the course of the year if he/she feels the facility needs extra guidance/monitoring. Sanitarians inspect restaurants and food establishments for compliance with Ohio’s Uniform Food Safety Code, including proper food storage, handling, preparation and serving. Food Code violations are broken down into two categories: critical and non-critical. Critical violations are items that, if in noncompliance, are more likely than other violations to contribute to food contamination, illness or an environmental health hazard. Examples of critical violations include food obtained from an unsafe source, inadequate cooking, improper holding, contaminated equipment, and poor personal hygiene. Non-critical violations cover such things as dirty floors, lack of hair restraints, and open waste receptacles. Health District staff have always practiced education over enforcement. In addition to required inspections, the Health District offers food safety training for licensed food service operators and retail food establishments to ensure that food service staff understand and follow proper food handling procedures. If you encounter a problem or have a concern while visiting a retail food establishment or food service operator, tell the manager and ask that it be corrected. If you are not satisfied with the response, or if you have a suspected food borne illness to report, contact our office immediately at (513) 946-7800 or online by clicking here. All complaints will be investigated. Please note that the Health District only accepts complaints from facilities located within Hamilton County (excluding the cities of Cincinnati, Norwood and Springdale). providing the public with information about the disease, along with prevention measures.